Frank Lewis O'Bannon (January 30, 1930 – September 13, 2003) was an American politician. 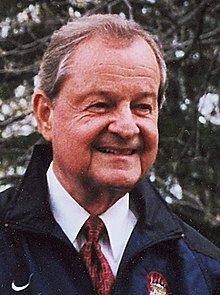 He served as the 47th Governor of Indiana from 1997 until his death in 2003. In 2003, O'Bannon suffered a massive stroke in Chicago, Illinois, while attending a trade conference. He died days later and was succeeded by his Lieutenant Governor Joe E. Kernan. ↑ "List of All Offices and Office Holders". 5 March 2015.